CES 2018: Vifa delivers new loudspeaker multiroom functionality | What Hi-Fi? If you love your music, getting it into every room of your house is vital - so those with Vifa products will be happy to hear the company is delivering multi-room technology to accomodate all the song-sharers. 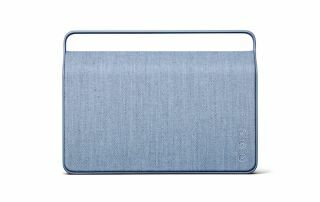 On the Copenhagen 2.0 soundbar or Stockholm 2.0 speaker (the latter pictured above), you’ll find a button to connect your loudspeakers together in one click. Vifa has also added a 'Play' button, which will immediately play a preset music service or radio station. Vifa has launched a companion app alongside it, called Vifa Home, from which you can play music (via Spotify, QQ Music or TuneIn) and group your loudspeakers together. You can also grab music from your TV, smartphone, tablet and music server. Alongside this new software, the Copenhagen and Stockholm products will be available in new “Mountain Blue” and “Pine Green” finishes.